Fr Niall O'Brien Returns from Captivity.1984..14.07.1984..07.14.1984..On 6 May 1983,Fr Niall O'Brien was arrested along with two other priests, Fr. Brian Gore, an Australian, Fr. Vicente Dangan, a Filipino and six lay workers - the so-called "Negros Nine", for the murders of Mayor Pablo Sola of Kabankalan and four companions. The priests where held under house arrest for eight months but "escaped" to prison in Bacolod City, the provincial capital, where they felt they would be safer.The case received widespread publicity in Ireland and Australia, the home of one of the co-accused priests, Fr. Brian Gore. When Ronald Reagan visited Ireland in 1984, he was asked on Irish TV how he could help the missionary priest's situation. A phone call the next day from the Reagan administration to Ferdinand Marcos resulted in Marcos offering a pardon to Fr. 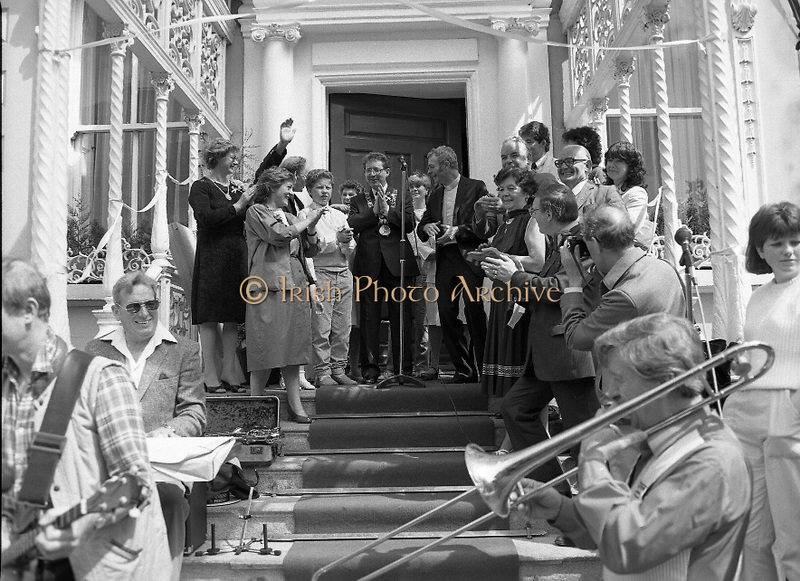 O'Brien and his co-accused..(Ref Wikipedia)...Image shows Dublin's Lord Mayor Michael O'Halloran, Fr Niall O'Brien and his family on the steps of the Mansion House as the band entertains the gathered crowd.